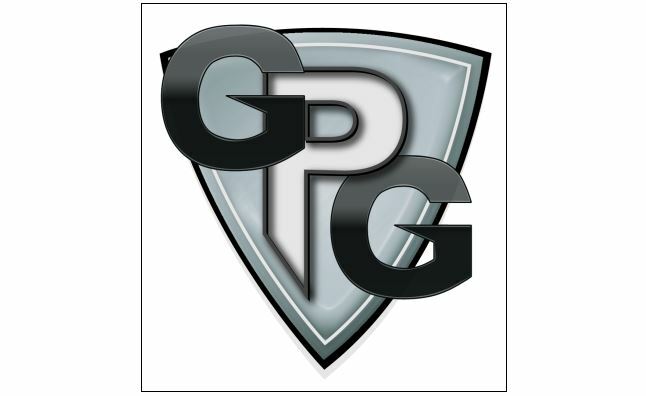 The Game Publishers Guild is a group of small, independent role-playing game publishers who have banded together in order to help strengthen their overall forces in this topsy-turvy world of gaming. Initially created by Aaron Huss of Mystical Throne Entertainment, the 7 charter members (Arcanum Syndicate, Cakebread & Walton, DramaScape, Imaginary Empire, Mystical Throne Entertainment, Rogue Games and Scrying Eye Games) hope that by joining together, they can achieve greater reach through conventions and retailers, where such action had not been previously possible. Membership is open and if you're interested in joining, you can contact any of the Guild members to see about the application process. 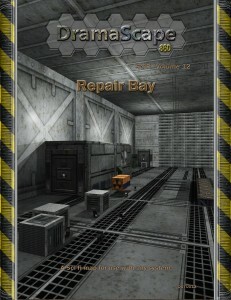 DramaScape has a new map available to download. It's been a while and it's good to see them with new releases again. This Product is a 48 x 30 inch, full color floorplan of a hidden Gorge. It comes with Square, Hex and No Overlays and includes the VTT files for online use. 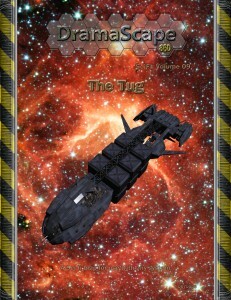 DramaScape is having themselves a sale over on DriveThruRPG in honor of their anniversary. Woo! 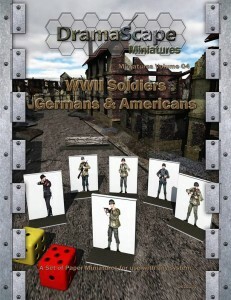 DramaScape has a new set of paper models available. These are humans and orcs and are seen from a top-down view. This product contains two topdown miniature armies, one orc and one human army set on a green field in addition to a 48 x 30 inch grass battlefield map with a road running north to south in the center of the map and a plateau along the eastern side of the map. Each army has melee, missile, magic, gunpowder guns, and mounted characters. The human knights are riding warhorses and the orcs are riding ankylosaurs. The orc army has a bolt thrower as a siege weapon as well. Each miniature is included as a 300 dpi png file and the board as a 100 dpi jpeg file so that you can make use of this product on your virtual tabletop (VTT). In total there are 12 different human footman miniatures, 3 human knights, 18 orc footman miniatures, 2 orc riders, and 1 orc artillery that you can print out and use on the tabletop or use with your VTT. This product is the first one in our Versus line which will pit two topdown armies versus each other on a single battlefield map. Each new Versus product will include two topdown armies and one battlefield for them to fight on expanding both the number of places to fight and the types of armies that can be paired together. 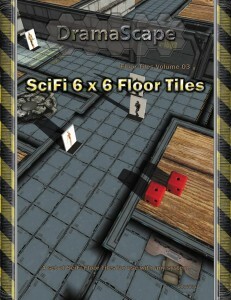 DramaScape has a new set of SciFi floor tiles available over on Wargame Vault. This product consists of modular 6 x 6 tiles that can build a multitude of science fiction facilities in space or on the ground. There are 59 tiles (front and back for 118 total). The set includes connective tiles such as hallways, doors, barriers, stairs, hatches, lifts, access tubes, access shafts, and other connective pieces. The set also includes destination tiles such as an armory, a bridge, a cargo room, a command center, a computer room, a cryo room, an engineering/power room, a med lab, a mess hall, a meeting room, personal quarters, and a security room and security scanner. With this many connective and destination tiles, you can construct a vast number of different science fiction locations for use in space or on land. Then deconstruct them and then recombine them for a totally new adventure location in next week’s session! This product has both a clean version and a rusted version of all the tiles. The clean version is great for a brand new facility or spaceship that was just opened or commissioned. The rusty version works well for an old facility or derelict spacecraft that needs explored by the group. Combining the clean side and the rusty side, you can create a ship or facility that was refurbished in some sections with the clean side while using the rusty side to denote the older sections of the ship or facility. 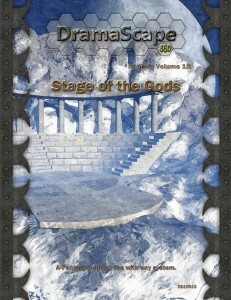 DramaScape gives you another floor plan you can use in your games with Stage of the Gods. This Product is a 48 x 30 inch, full color floorplan of a mountain stage. 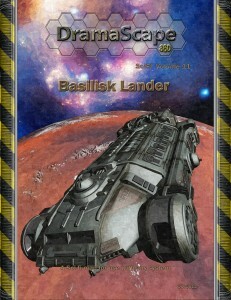 DramaScape gives you more sci-fi maps for your gaming sessions with the Basilisk Lander and The Protocursor. DramaScape is having themselves a sale in honor of GMs Days. There is 25% off all our maps in the DriveThruRPG's GM's day sales, 7 days to get yourself a bargain. 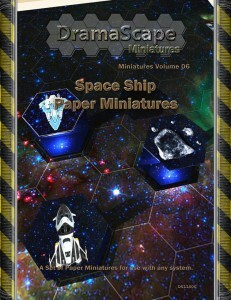 DramaScape has some new Space Ship paper miniatures available over on DriveThruRPG. Our latest release is a set of paper space ship miniature for use in tactical space combat, these work well with our Star Maps product and can be used with any system. 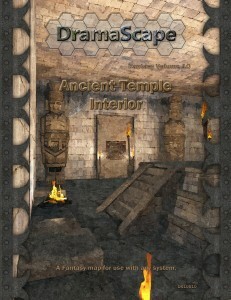 DramaScape has their first map available that you can now order in printed format: the Ancient Temple Interior. Don't cross the light beams. Our first Print on Demand Map is now on sale, it comes on high quality 12 pint card, and is UV coated, which means they wipe clean and you can use dry wipe markers on them. If you love maos but hate printing them out these are ideal for you. DramaScape gives us another terrain map. This one's the Power Room and Converter Room. Another set of floor plans from DramaScape, for those critical moments when you have to shut off the tractor beams. 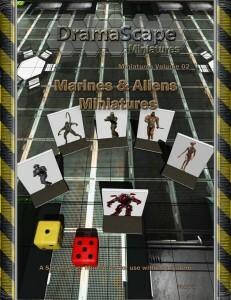 DramaScape doesn't just do terrain maps, they also do paper minis. Their latest are WWII Germans and Americans. We thought we would get a set of WWII figures out, Over 100 figures in the pack. 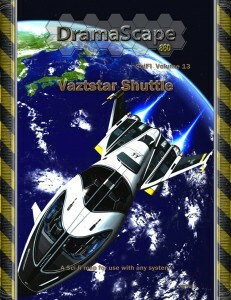 DramaScape gives you more terrain map options with the release of their Vaztstar Shuttle floorplan. The Vaztstar is meant for in-system quick travel. One idea for using the ship is that a wealthy entrepreneur who loves using it to race and joyride owns the Vaztstar. DramaScape keeps churning out these maps and we keep posting them (just the way I like it!). Here's the latest: The Repair Bay. If you're looking for a chop shop or just looking for some repairs, here's the place to go. 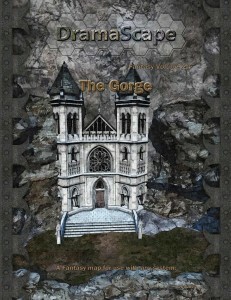 DramaScape is bringing you another map. This one's more fantasy-inspired... The Skull Throne! 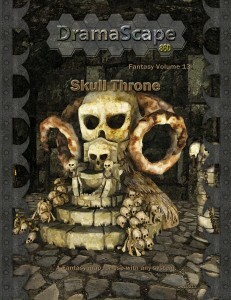 Time for a fantasy map from us, deep in the sewers is the Skull Throne, can you find it? 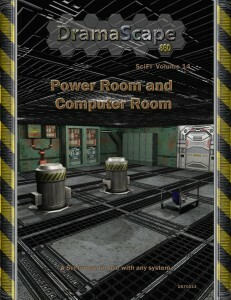 DramaScape does more than just terrain mats. They've also got paper minis. Here's their Sci-Fi set. Our 3rd set of Paper Miniatures, ideal for all scifi rpg's. 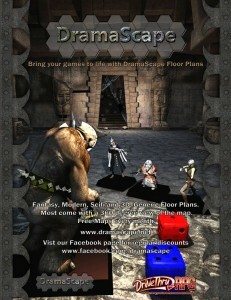 DramaScape gives you some more floor plans to work with (will they ever end? I hope not). This time it's the Basilisk Lander. The new Basilisk Lander is a shuttle designed for passenger or Prisoner Transport, ideal for your sci games. DramaScape gives us another of their floorplans. This one's for the Med Bay to help get you stitched back together after playing on one of the other maps. 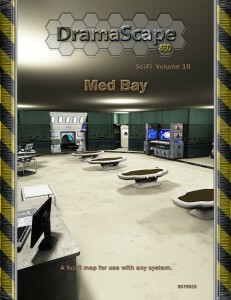 The new Med Bay floor plans from DramaScape, for those days when even the best laid plans go wrong. 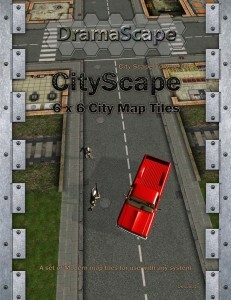 DramaScape also has some new terrain for you. The Tug is their latest terrain map. The Tug is a new set of Space Ship Floor Plans, something to explore the deep recesses of space with. 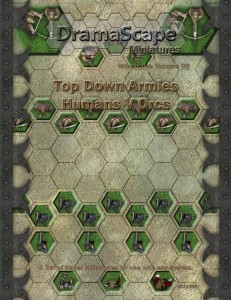 DramaScape put out another of their battlefield terrain maps with the Protocursor. 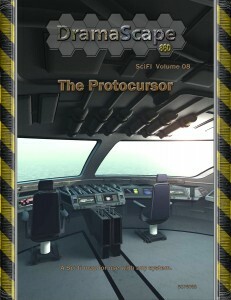 The New Protocursor floor plans from DramaScape, a crashed ship on an Ice Planet. 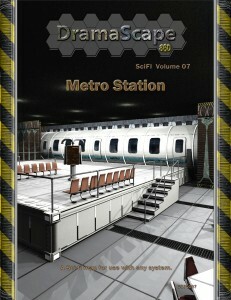 DramaScape gives you another floorplan map with the Metro Station. 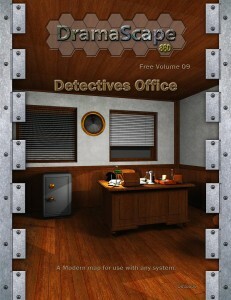 DramaScape gives you a new, free map for January. Check out the Detectives Office. Our First Map for 2013 and its Free, the Dectectives Office, its small but packed with fun. 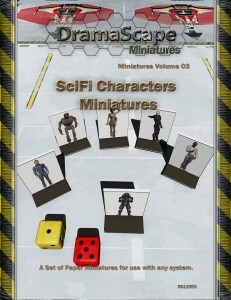 DramaScape doesn't just do maps, but does paper minis as well. Here's their latest set: Sci-Fi Marines and Aliens. Our second paper miniatures set has just been released, good for the bug hunt games or you could just nuke the site from orbit.